or, what were they thinking? Can you guess what the door on the right leads to? Remember that this my kitchen. So it would have to be a pantry? No. Stairs to the basement? No. Panic room? 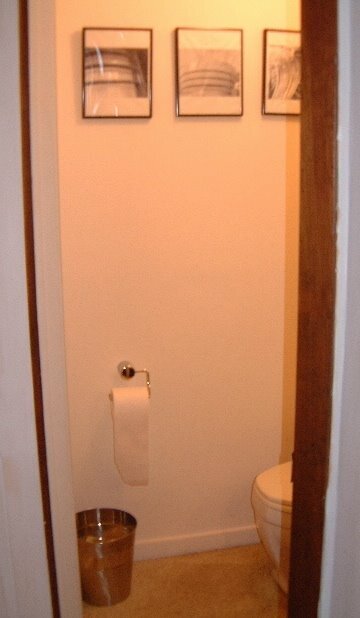 wait for it....... yes, it's a powder room, also known as a half bath here. Just what you want in a kitchen. 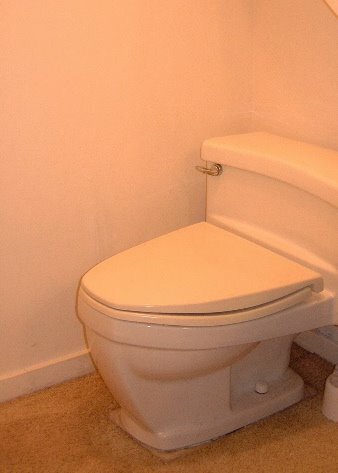 Actually, it makes great use of the space under the stairs and it's directly under the master bathroom so the plumbing must have been a breeze. What really makes me wonder is they used carpet as flooring. Carpet? In a bathroom? In a loo that's in the kitchen? It's got to go, especially as the little overflow pipe thingy inside the cistern keeps jumping out of it's mooring when the WC is flushed and spraying the wall and the carpet. Soaking wet carpet. In the bathroom. In the kitchen. Lovely. My aunt had a really old house and there was a 1/2 bath off of the kitchen. I think this was common as most houses didn't have bathrooms downstairs so usually a small closet was converted to make a 1/2 bath. I also have a bathroom off of the kitchen. 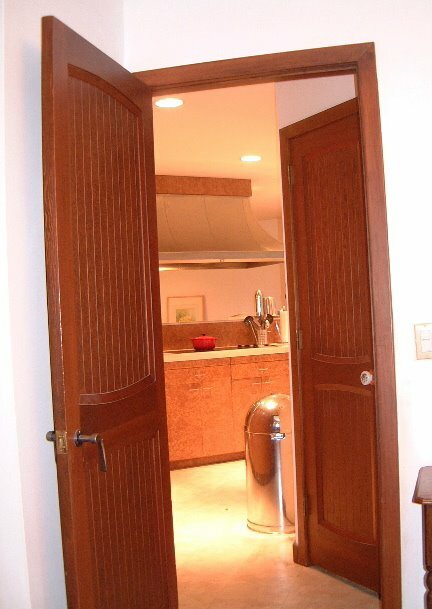 It has a door at each end so it is accessible from a lower bedroom and the kitchen. This was probably a pantry once. That I could understand. I once lived in a house where the bath was in the kitchen-literally. You took off the countertop and there was the bath. Also the WC was outside. But that was a very old house, in a very old country. We have the plans for this house, which was only built in 1968, four and a half baths - one in the kitchen. I wondered if the door was supposed to be in the foyer rather than the kitchen but plans don't indicate that. Could it have been a butler's pantry kind of thing converted into a bathroom? My 1927 house has a 1/4 bath in the basement, in a little concrete block room with no door. Just one lonesome toilet. It's very odd. Yep, our house had carpet in two of the bathrooms. Green carpet. Yummy.